Sift together the flour, baking powder, mace and salt. Set aside. Cream the butter and sugar well, or until light and fluffy. Scrape the bowl. Add the eggs one at a time, beating well after each addition. Scrape the bowl again. Stir the vanilla into the milk and add the dry ingredients alternately with the milk and vanilla mixture. Mix in the lemon zest and juice. Scrape the bowl and give the batter one last quick little mix. Pour the batter into the prepared pan and bake for l hr. and approx. 35 minutes (check after 1 hr. and 25 minutes), or until a toothpick comes out clean and the cake springs back when gently pressed with your finger. Cover the cake with a clean dish towel and cool on a rack away from drafts overnight. Carefully slice the cake into three equal layers with a long serrated knife that extends beyond the sides of the cake (I used my bread knife): Place the first sliced layer from the top of the cake onto another plate and cover with wax paper. Slice the next layer and position on top of the first sliced layer. Leave the remaining layer on the serving platter. Beat the butter, powdered sugar and milk very well until glossy, adding the milk a little at a time, as needed, for spreading consistency. *Add a little more milk, as needed, if you would like the frosting to drizzle a little over the sides of the cake, as in the above photo. Add the vanilla and 6 large chopped strawberries, then mix until pale pink in color with flecks of the strawberries. Spread the frosting between the layers and on top of the cake: Begin with the layer left on the serving platter, then add the next layer from the extra plate and end with the remaining layer from the extra plate (which will be your top finished layer). Let the frosting drizzle a little over the sides of the cake, as in the above photo; or, for a more precise look, just carry the frosting not quite all the way to the edges of the layers. This cake actually improves with flavor after a couple of days, and it freezes very well. Keep it in the refrigerator or freezer (thaw in the refrigerator one day before you serve). Then the day you serve the cake, decorate the top with the sliced strawberries in an attractive pattern...use the above photo for a guide. 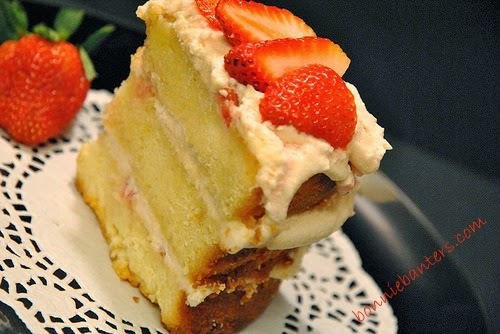 Strawberries are served alongside each piece of cake (rather than placed between each layer), so the cake will last a little longer in the fridge...up to a week. Enjoy a fresh start to spring with this irresistible cake! Oh my goodness...that looks beautiful, Bonnie. Whoa, does this look like the perfect dessert to usher in strawberry season! Just gorgeous, Bonnie! This looks delicious Bonnie. I'm not much of a frosting fan, so this has the perfect amount for me. Hi Nicky! 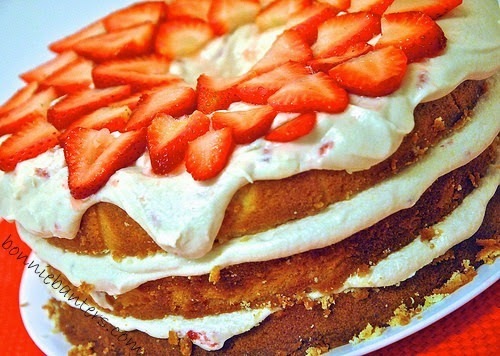 It's actually quite a bit of frosting; but you can adjust the amount to your taste, or even halve the frosting recipe...leave the strawberries for the top of the cake the same. Thanks for visiting, and glad you like the recipe...enjoy! Come back often! Angela, Liz and Regina, thank you so much for your comments...always glad to see you!